MAY 19—Khari “KJ” Herbert won the 400m at Saturday’s 37th Golden South Classic in Orlando, Florida, while Kyron McMaster was fourth with a time that improved his National Scholastic Record in the event, leading four athletes to career best performances. Herbert used a personal best of 47.21 seconds to cut the tape with Kyron McMaster taking fourth in a personal best 48.14. Herbert, who lowered his personal best from 47.31 at the Florida Class 3A State meet, ran 47.85 in the prelims while McMaster had dropped his best from 48.76 at the Carifta Games to 48.50. In the Girls 400m, Tarika “Tinker Bell” Moses was third with a lifetime best of 55.02 seconds, lowering her previous mark from 55.62. The time moved the soon to be 16 year old to #5 on the territory’s All Time List. She won her preliminary heat in 55.37. Lakeisha “Mimi” Warner was third in the 800m in 2 minutes 13.51 seconds. 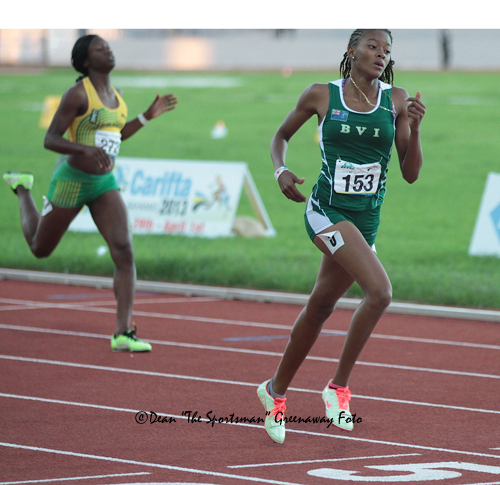 L’Tisha Fahie lowered her 100m best from 12.34 seconds to 12.27 in the 100. She ran 25.91 in the 200m. Dekoya Hodge had a throw of 9.18m in the Shot Put and Shanakay Wheatley leapt 10.28m in the Triple Jump. City College of New York's Garnett "Rugged" Vanterpool ran a 200m personal best of 22.03 to close out his season. At the Ponce Grand Prix in Puerto Rico, Karene King placed fourth in her 200m heat in 23.67 seconds as she and several participants in the competition, tuned up for the June 1, BVI Twilight Invitational. The meet will be run in conjunction with the Leeward Islands Jr. Invitational, which features several Carifta Games finalists and medalists. Athletes for the Leewards Invite are expected from: Anguilla, Dominica, Guadeloupe, St. Kitts, Nevis, Montserrat, Trinidad and the U.S. Virgin Islands.